A regional publisher’s ‘pop-up’ pro-European newspaper has today reached its 10th edition – after exceeding its initial print run by six weeks. 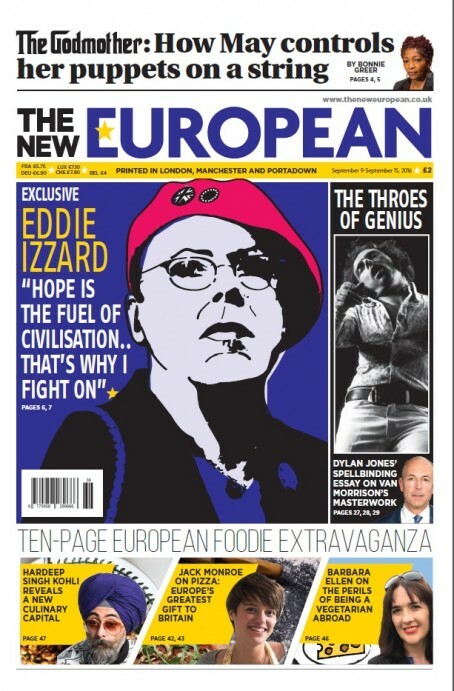 Archant launched The New European in the wake of The UK’s vote to leave the EU, to cater for the ’48pc’ of the electorate who voted against the decision. Its first issue in the streets on 8 July, just nine days after it was first conceived by editor Matt Kelly – thought to be the fastest newspaper launch in UK history. Originally slated for a four-week run, the company announced it would continue to publish TNE on a rolling basis after exceeding its sales targets. The newspaper’s retail distribution is focused on London, Liverpool, Manchester, the south of England, Scotland and Wales and other strongly Remain voting areas. Recently, it has also been circulated abroad in cities including Brussels, Paris, Strasbourg and Berlin, as well as Northern Ireland. Contributors to the paper so far have included Alastair Campbell, Miranda Sawyer and Peter Mandelson. Er, it continues to look really rather good. I’ve been studiously reading the comments on this website for some time now and had naturally come to the distinct conclusion that the Archant senior team was a bunch of buffoons hellbent on suffocating any decent journalism wherever it may be found. And yet… The European is, by common consent, a bloody terrific newspaper. Can the usual suspects – the ones with the nearly-witty usernames (funny how you can spot an average sub a mile away!) illuminate me? How is this possible? Are there TWO Archants? I’m as confused as Confused. The European is, as he/she says, a bloody terrific newspaper. Yet Archant as a whole is seen as a bunch of numpties (Mustard TV, anybody?). Clearly, though, they have among their ranks staff who know exactly what they’re doing. But as it was only supposed to last four weeks, could this be a case of Archant succeeding in spite of themselves? Whatever, it’s a great product and I hope it hangs around for a long time. Confused – you seem to be in a permanent state of confusion. Life must be difficult. But you’re quite right. The New European is a decent product. Why don’t you and your colleagues put the same enthusiasm, energy and effort into your flagship titles? If you did, it might boost the morale of staff on the ground and stop them feeling so under-appreciated. How surprising. I thought it only circulated in Islington. Yes it does have exclusive content, which makes it attractive to those with a certain view over Brexit. Most of the commentators are from either the UK or EU and are totally pro-EU and as such hate the UK. There is hardly anything about the UK in it, just EU events and how wonderful the EU is. This is one reason why Cameron et al, lost. Saying the UK cannot exist without the EU…praising one side while putting down another. The letters page is full of correspondence and diatribe from deluded souls who feel the New European is for them and gives them a chance to ignore democracy and hold another referendum until the result they seek is found. The lefties which read this newspaper will, quite rightly, be the first to cry out for democracy in other non-democratic countries, but because they just didn’t like the result of our own democratic process are the first to cry foul. Plus, this pioneering paper held advertising auctions, which HTFP mentioned before, but they have not followed it up. Did anyone see these auctions? Over a few days, there was NO interest in advertising whatsoever, even at just £300 for a full Berliner sized page. The only bids were on the final day, when several bids came in, with the winning bid at £525. Strange? I suspect Archant bods did that to save face. (And as for the whole newspaper takeover, that died a death too). So, while some may view this as a great paper, most advertisers certainly do not..not even for a giveaway £300 per page! Norfolk n good (and yes, that’s one of the nearly-witty ones I meant) .. you are the confused one. I haven’t been in the newspaper game for nigh on twenty years. just an interested observer and investor. Is this really anything more than a glorified comfort blanket for those licking their wounds over the EU referendum result. Yes it looks good and it’s well put together but surely this is a case of preaching to the converted. It’s all very well trumpeting its success after 10 whole editiions but I wonder what will happen once the novelty of this bright new shiny thing wears off. In other news Archant’s core publication, the EDP, bludgeoned by staff cuts and starved of investment continues its inexorable slide. Well done Archant, this proves that if you gauge the audience reaction right and work fast, success awaits, great idea and very well executed! Confused: somebody who’s been out of newspapers for 20 years in presuming to know what it’s like for those living with the grim reality shocker. Who exactly is the armchair warrior here? Fantastic to see that there are still people willing to bash a success story. Matthew Knight & archantlifer: take yourselves outside and give your heads a wobble! “Success story” – is that measured by how many they actually sell (does anyone know this real figure yet – ie, not the number printed but after the returns come back). Also, if a successful newspaper cannot giveaway a full-page advert (Berliner size) to any nationwide big business, or even European business for that matter, for just £300, how is that a measure of its success?! The only achievement, as I have already said, is that it has exclusive content, can be written throughout the week as there are very few “news” items, and that it was reportedly conceived in a few days or something. This is good – even though Archant’s Norwich subbing hub is used to churning out page after page for all their publications! But when we don’t even know its real sales figures (and as I say, the industry has gone extremely quiet over the “pioneering idea of auction advertising” – where are the follow-ups?) Well, its obviously because it was nowhere near a success. I watched the auctions, no one was interested. Pure and simple. Its ok selling X number @£2 each, but without pages of adverts, I wouldn’t yet call it a success. I would no more regard the New European a success after 10 editions than I would regard Norwich City’s season a success after 10 matches. The NE has defined and attracted an audience which is good but let’s see how the land lies in a year’s time. Let’s have some properly verified revenue figures and costings. I’m staggered that this is still going. I’d love to know how many it sells. To be fair, “preaching to the converted” has been quite a successful model for many national newspapers over the years. I’d also add that despite the low esteem in which Archant is held here (perhaps rightly, I wouldn’t know – it’s 15 years since I worked there) its dailies, at least, always continue to look good. It’ll be interesting to see how long this lasts, and whether it’s able to morph into something less specifically Brexit-related.